Last November, sixteen undergraduate students from around the world came together in Texas to combine their skills and tackle the issue of violence. This was part of Computing4Change, a program dedicated to empowering students of all races, genders, and backgrounds to implement change through advanced computing and research. The challenge was developed by Kelly Gaither and Rosalia Gomez from the Texas Advanced Computing Center (TACC), and Linda Akli of the Southeastern Universities Research Association. Three years ago, as the conference chair at the 2016 XSEDE conference in Miami, Gaither wanted to ensure that she authentically represented students’ voices to other conference attendees. Akli and Gomez led the student programs at the conference, bringing together a large, diverse group of students from Miami and surrounding area. So she asked the students what issues they cared about. “It was shocking that most of the issues had nothing to do with their school life and everything to do with the social conditions that they deal with every day,” Gaither says. After that, Gaither, Gomez, and Akli promised that they would start a larger program to give students a platform for the issues they found important. They brought in Ruby Mendenhall from the University of Illinois Urbana-Champaign and Sue Fratkin, a public policy analyst concentrating on technology and communication issues. 48-hour challenge. 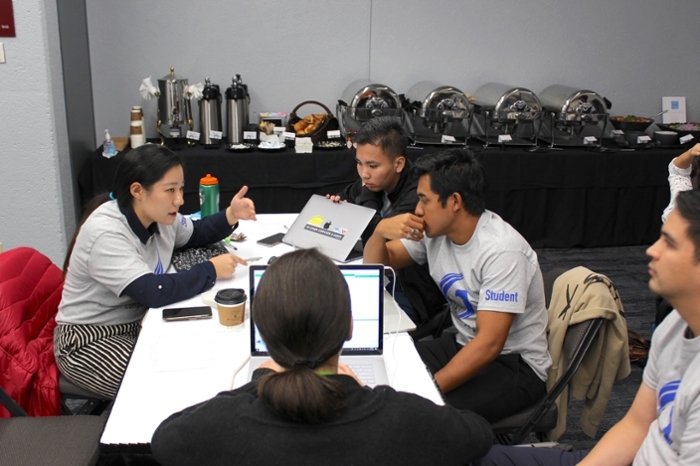 The student competitors had only 48 hours to do all of their research and come up with a 30-minute presentation before a panel of judges at the SC18 conference in Dallas, TX. Courtesy Computing4Change. Out of that collaboration came Advanced Computing for Social Change, a program that gave students a platform to use computing to investigate hot-button topics like Black Lives Matter and immigration. The inaugural competition was held at SC16 and was supported by the conference and by the National Science Foundation-funded XSEDE project. In 2018, Gaither, Gomez, and Akli made some big changes to the program and partnered with the Special Interest Group for High Performance Computing (SIGHPC). As a result of SIGHPC’s sponsorship, the program was renamed Computing4Change. Applications were opened up to national and international undergraduate students to ensure a diverse group of participants. “We know that the needle is not shifting with respect to diversity. We know that the pipeline is not coming in any more diverse, and we are losing diverse candidates when they do come into the pipeline,” Gaither says. The application included questions about what issues the applicants found important: What topics were they most passionate about and why? How did they see technology fitting into solutions? Within weeks, the program received almost 300 applicants for 16 available spots. An additional four students from Chaminade University of Honolulu were brought in to participate in the competition. In the months leading up to the conference, Gaither, Gomez, and Akli hosted a series of webinars teaching everything from data analytics to public speaking and understanding differences in personality types. Although they interacted online, the students didn’t meet in person until they showed up to the conference. That’s when they were assigned to their group of four and the competition topic of violence was revealed. The students had to individually decide what direction to take with the research and how that would mesh with their other group members’ choices. The teams had 48 hours to do all of their research and come up with a 30-minute presentation to present to a panel of judges at the SC18 conference in Dallas, TX. All mentors stayed with the students, making sure they approached their research from a more personal perspective and worked through any unexpected roadblocks—just like they would have to in a real-world research situation. For example, one student wanted to find data on why people leave Honduras and seek asylum in the United States. Little explicit data exits on that topic, but there is data on why people from all countries seek asylum. The mentors encouraged her to look there for correlations. The Computing4Change mentors also coached the students to analyze their data and present it clearly to the judges. Gaither hopes the students leave the program not only knowing more about advanced computing, but also more aware of their power to effect change. She says it’s easy to teach someone a skill, but it’s much more impactful to help them find a personal passion within that skill. The next Computing4Change event will be held in Denver, CO, co-located with the SC19 conference Nov 16-22, 2019. Travel, housing, meals, and SC19 conference registration covered for the 20 students selected. Application deadline is April 8, 2019. Apply here.